If houses could talk... this house built in 1939 has had two owners. My parents purchased this in 1952 when the Seattle city limits were at 85th street. My dad paid $9100. There were empty lots for us kids to play in and plenty of neighborhood parties. We could walk down to Matthews Beach through the woods and cross the railroad tracks before it became Burke-Gilman trail. We had bicycle parades with playing cards clothespinned to our spokes. We dragged wooden hydroplanes behind our bikes and could even hear the hydroplanes roar during the Gold Cup. Our house heard music sung by my dad (tenor) in the shower or accompanied by mom on the piano. Every first day of school my brother, and sister and I stood outside in the yard for mom to snap a photo. My dad taught all he neighborhood kids how to play "kick the can". It was a phenomenal neighborhood to grow up in with window painting contests at McVicar Hardware and rollerskating down the next block on the "smooth street". The Easter bunny, tooth fairy and Santa always found us. 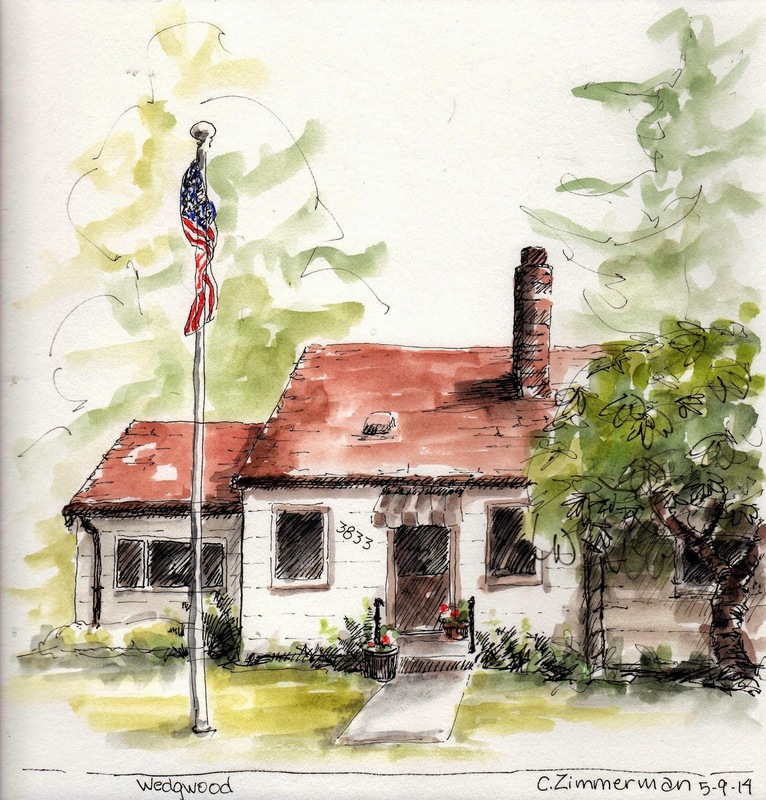 As urban sketchers, we often paint the structures in the communities where we live. But it is the memories that connect us to tradition in these communities which remain close to the heart. You've called it your old house when really it was your HOME! Lovely memories to be cherished....thank you for sharing. My tears are obscuring your heartfelt post..thanks so much. As we process grief and separation, I have delineated "house" from "home". House is the body, but home is the spirit that carries on. My parents just moved into assisted living yesterday. We will be doing the same with their home. Beautiful sketch! Thanks Gail. Good luck to them. I wish you all well.